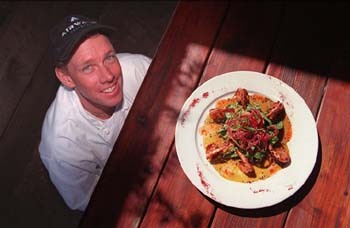 A Place in the Sun: Chef Pelle Nilsson catches some rays on the patio alongside a peppery prawn appetizer. OCCUPYING GROUND zero in the most fashionable quartier of downtown Palo Alto, Fanny & Alexander must be good enough to have stood the test of recent time among very fine company. Wedged in, metaphorically speaking, between Spago Palo Alto and Evvia, Fanny & Alexander plays a high-stakes game and, from the look of it, wins more than a few of its matches. While we weren't prepared for the upscale but unapologetically sporty ambiance, we definitely came to dine. Seated on a tenuous dais supporting three tables--it was either that or sit outside along with a very large corporate party--we regretted the soaring decibel level powered by uncarpeted flooring. The menu, however, was anything but regrettable. A serviceable--but not much more--Sterling Pinot Noir 1997 ($33) was presented by our very helpful but very inexperienced wait person along with some excellent francese. The menu here is tough. There's lots of world fusion influence on this menu--spicy Thai shrimp and cognac-cured salmon carpaccio both show up as appetizers, while the entrees linger long in the region of Southwestern and blackened meats. Fresh Pacific salmon was available in a variety of presentations, and the adventurous Paolo ordered his rolled and baked in nori with a garlic black bean sauce ($17.50). Jack went for a nightly special of chile and garlic marinated grilled pork loin ($13.95). Lucy chose crab-stuffed chicken breast ($15.25), while I succumbed to an order of pan-roasted filet mignon slathered with gorgonzola and cognac sauce ($18.95). Despite the rather spartan decor and boisterous bar, we were delighted with our starters of crab and shrimp cakes ($7.50), a gooey, voluptuous Napoleon of roasted eggplant with spinach, tomatoes and mozzarella ($6.25) and a splendid version of clichéd blackened shrimp over baby greens ($8.25). And let me say that these wonderful, moistly grilled shrimp were extremely blackened, as in hot as hell. A solid cut above genre standards, the crab and shrimp cakes arrived plump, succulent and festooned with spun beets, spun carrots and a sweet chile and chive oil. While Jack thought the eggplant dish was overly oiled, I found it lavish and generous--like a vegetable version of Sophia Loren. Our entrees were even better--and the ambiance grew cozier once the spare, open entry area started filling up with cocktail consumers. The filet mignon was flagrantly tender, like butter and satin all drenched in the ripe gorgonzola. It was topped with a thicket of crispy onions that had to be swept aside in order to locate the steak. Grilled zucchini cut into long strips sat next to a scoop of mashed potatoes tinted pale chartreuse by some green herb. The same squash and potatoes showed up on Lucy's wonderful chicken breast, utterly moist and enhanced nicely by a light mustard sauce inflected with sun-dried tomatoes. Jack's huge slices of pork loin had been expertly grilled to leave them juicy and medium rare. Their chile marinade was subtly evident, and they arrived with a richly flavored garnish of garlicky roasted tomatoes. We had all fallen seriously in love with this food. Only a rather fussy presentation of salmon, arranged into faux sushi rolls filled with bits of shrimp and spinach and then buried under a collage of spun vegetables, failed to go the distance. The fish itself was very lovely, however, and frankly we ate almost everything on every plate. Especially the charming Paolo, who made up for his salmon by telling tall tales and sampling vigorously from all the other plates. Obliged to sample dessert, we chose an Irish Cream cake from choices that included a chocolate cake and New York cheesecake--there must be a law somewhere about having to offer this dessert. We all dug in and oohed and aahed a lot as we did. Beautifully frosted with a thick ridge of chocolate ganache, the cake was a mousselike tribute to Irish Cream liqueur--and good. It reminded me of a Spielberg film--I loved it but was ashamed to admit it. Its name may be puzzling, but the restaurant showcases a chef with distinct flair, audacity and a love of bold flavors. Fanny & Alexander is more than just another good-looking watering hole filled with good-looking people. From the May 20-26, 1999 issue of Metro.